Brendan Connolly claimed the hearts of the Belfast Giants fans with a Valentine’s night hat-trick to help secure a 6-4 victory over the Dundee Stars. Before the game Giants coach Adam Keefe said that his focus was now simply on winning matches and although they were behind before Connolly’s second-period double put them in front that’s exactly what the Giants did. Their character showed through too, not only in fighting back from the Stars’ opener after 14 minutes, but to regain the lead after Dundee levelled three times before Darcy Murphy’s late go-ahead goal and then Connolly’s even later empty-net strike which completed his treble. After killing an early penalty the Giants came within inches of opening the scoring when Steve Saviano struck a post and the frustration grew when a 47-second five-on-three failed to deliver an opening goal. Two minutes after that missed powerplay opportunity it was Dundee who grabbed the lead at 14:03. Jordan Cownie pulled the puck from behind the net to Adam Harding in a great position in front of goal and Jackson Whistle stood no chance. After having to kill a five-on-three when Jonathan Ferland and Spiro Goulakos were sent to the penalty box the Giants went on a powerplay of their own that straddled first and second period, but failed to really threaten. The equaliser finally arrived at 24:37. A defensive error in the Dundee zone was pounced on by Connolly and he skated in one-on-one with Stars goaltender Travis Fullerton before firing home. It was a penalty against Fullerton that led to the Giants taking the lead on a powerplay at 30:33. Whistle sent the puck forward, Connolly won it and again took on Fullerton one-on-one, producing a classy finish. That sparked a goal-rush that saw three scored in just over two minutes. Seventy seconds after going behind Dundee made it 2-2 when Jimmy Jensen was sent through on Whistle and beat him with a shot that went high into the net. There were only 65 seconds between that goal and a strike from Murphy that put the Giants back into the lead. Dustin Johner showed some neat skating before pulling the puck from behind the goal into the path of Murphy who beat Fullerton before firing the puck home. 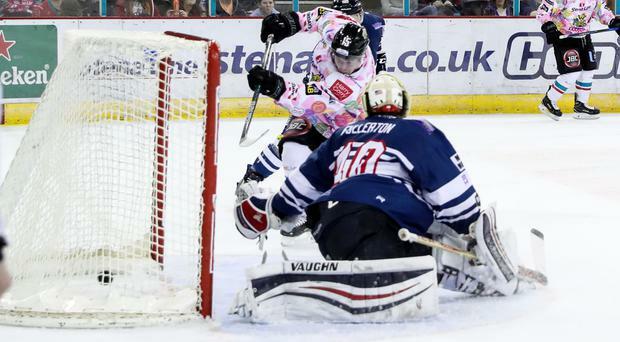 The Giants contributed to their own downfall when Dundee levelled again 16 seconds before the end of the second period. Penalties against Cole Jarrett and Goulakos put Dundee on a five-on-three and Anthony Mastrodicasa took full advantage to make it 3-3. Another powerplay helped the Giants take the lead for the third time in the game at 48:37. Cody Carlson was called for a roughing offence and Blair Riley got his stick to David Rutherford’ shot to deflect it past Fullerton. Just less than five minutes later they were level at 4-4 when Jensen scored his second of the night when he was first to react to a rebound after a Whistle save. A third Giants powerplay goal of the night put them back into the lead with just less than two and a half minutes to go, this time Murphy with his second of the game after Riley and Rutherford had opened up the Dundee defence to make his task of putting the puck into the net an easy one. With a minute to go Dundee pulled Fullerton in search of an equaliser, but to no avail as after Kevin Raine won the puck and found Connolly he sent it from distance into the empty net to complete his hat-trick and make sure of the victory.